Our Strutwipes are an excellent choice for cleaning chrome piston cylinders and struts. The wipe is presaturated with top of the line hydraulic fluid: Royco 756. It includes a disposable non-latex nitrile application glove. Our Strutwipes are an excellent choice for cleaning chrome piston cylinders and struts. The wipe is presaturated with top of the line hydraulic fluid: Royco 756. Protect your personnel from hazardous hydraulic fluid until use with our three layer lamination foil packaging that eliminates vapor exposure emitted by hydraulic fluid. Always wear appropriate personal protective equipment when working with hazardous material. 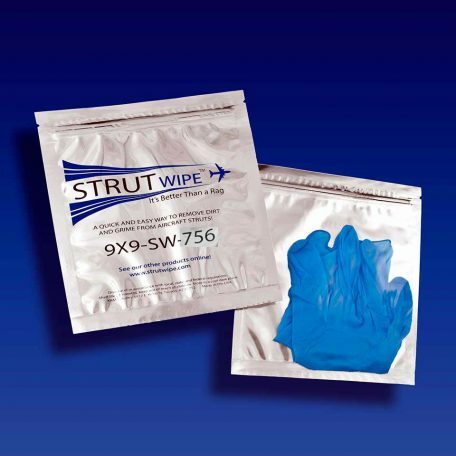 Note: For longer shelf life, we manufacture your wipes the day after your order is placed. 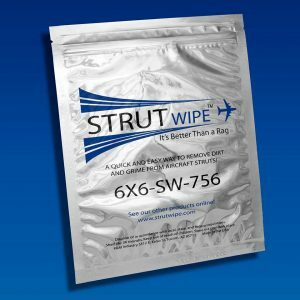 Our hydraulic presaturated wipes are lint and static free, made of 100% cotton cloth woven and finished without starch, binders, or any foreign substances. The cloth finish gives this wipe a softer and better dirt-trapping capacity. 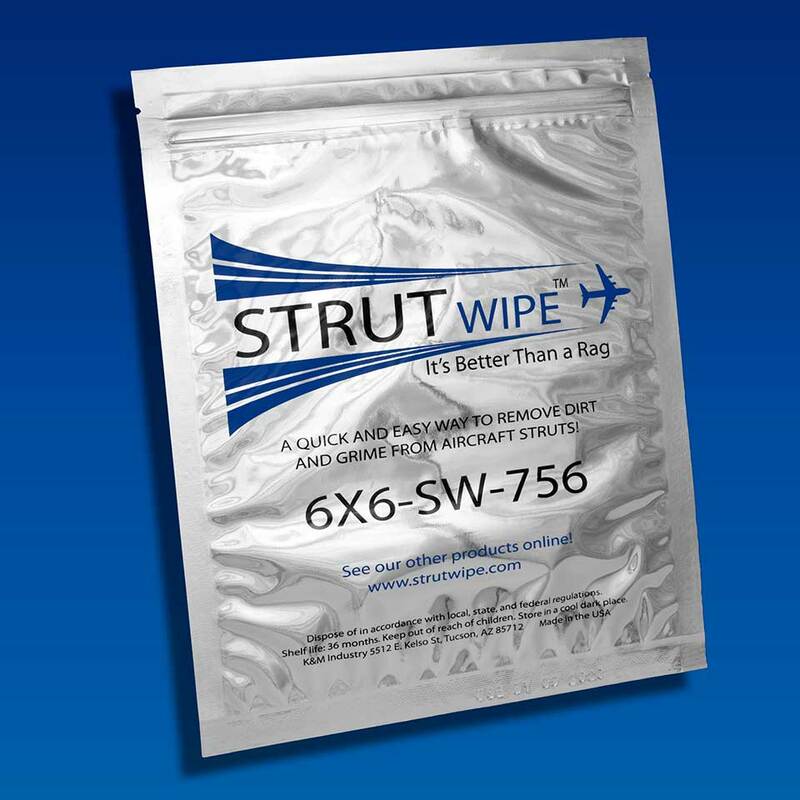 This wipe is pre-soaked with hydraulic fluid MIL-PRF-5606 and has incredible retention to minimize fluid drip. This product includes a disposable non-latex nitrile application glove in the package. No need for additional gloves or rags! VERY EASY AND ECONOMICAL WAY TO CLEAN THE CYLINDERS & STRUTS. CONTROLLABLE METHOD FOR THIS PROCESS THAT GENERATES AN ACCEPTABLE AMOUNT OF WASTE. A VERY INVENTIVE AND OVERALL GREAT IDEA! The best part about Strutwipe, you are not leaving the can of 5606 just sitting on the shelf. The can gets used a couple of times and then thrown away. Now that’s waste! Love these things. Great for cleaning struts, effective for removing dirt and crap and leaves the chrome shiny. They are so much better than paper towels or dirty rags and the glove makes it easier still. The idea to pair up the glove with Strutwipe actually came from a customer. He owns a private jet business and complained that his hands were oily and had to handle his customer’s luggage. Problem solved! Our Strutwipes are an excellent choice for cleaning chrome piston cylinders and struts. The wipe is presaturated with top of the line hydraulic fluid: Royco 756.